Either Kirkman is getting transparent in his old age or I am getting good at seeing through him in mine, but the latest volume of The Walking Dead makes to answer the question I claimed was being raised in the surprisingly recent volume, Life Among Them. That question being (to recap), can Rick and his band make the transition from a life on the run to a life of planned safety, after so very long in the valley of the shadow of brain-eaters? I won’t, of course, tell you the answer, but I have to share the anticipation I felt from the title page, wherein the name of the book was revealed to be Too Far Gone. Rick’s struggle (really, everyone’s, but as ever he serves as stand-in for the whole group and for the reader alike) to retain his humanity in the face of an increasingly inhuman world is all very interesting, but I feel compelled to talk about the new TV show rather than extensive spoilers I’d otherwise be forced to resort to. It’s good, and it quickly deviates to some degree from the written account, which is honestly preferable for this kind of story, more about characters than story arc. I guess I exaggerated a little, as I mostly want to talk about the effects of the show. I’m very pleased it’s on the recently successful AMC, where a lot of people are catching onto both a dramatic zombie story at a time when the genre has been overplayed to the point of parody and to graphic novels at a time when the surplus of superhero movies, however well made, are making people forget how much more the medium has to offer. I have anecdotal barstool evidence to back this up, too! …er, the part where people are taking the zombies and the graphic novels seriously, is what I mean to say. This entry was posted in Words and tagged graphic novel, horror on November 28, 2010 by Chris. It is Really Hard to wait for new graphic novels to be released on their own schedule, you know? Or it could be that with the decades of digital Marvel comics I have access to and the decade (singular) of Ultimate Comics I’ve read over the last few years, I’m just extremely spoiled right now. All the same, it’s more exciting now when a good one arrives on my doorstep, and I guess that’s a fair trade-off, right? Case in point, the newest Ultimate Spider-Man. Chameleons introduces another take on an old villain, of course, as you can imagine from the title. Well, really, it’s more like what I can imagine from the title, since you don’t read this many comics from the ’60s (and now I’m almost halfway through the ’70s, so, wow), but yes, there was a master of disguise called the Chameleon, back in the day. But next to such “sub”-plots as the government’s ongoing war against mutants, the Watcher’s choice for savior of mankind, and the return of J. Jonah Jameson, mere supervillainy doesn’t hardly rate. And since the Chameleon story was the only one that had me gasp in disbelief, it’s not like I’m saying it’s just because it wasn’t very good. I guess my point is that next spring the Ultimate Comics line is set to explode, with maybe five different new titles, but for now Bendis still has the most control over the path of the overall story, and while that means Spider-Man is sometimes a bit player in his own title, it also means that the overall story is in the most capable hands, and I really like what’s being done with it. I can’t be shocked by the [re]appearance of Rick Jones, but I sure can be disappointed. This must be what it feels like to a be a Trek fan who hates Wesley Crusher. This entry was posted in Words and tagged graphic novel, Marvel, superheroes, Ultimate Series on November 28, 2010 by Chris. At this late date, it is essentially a given that a Harry Potter movie will be financially successful, capture some number of iconic moments, and have pacing problems inherent in adapting a multi-hundred-page book to a substantially-fewer-minute movie. Upshot: except in case of unforeseeable production errors, you already know everything you need to know to decide whether or not to go see part one of the series’ climax. Which leaves me with the unfortunate task of coming up with something to add to a closed topic. Well, first I have the task of saying that there is no inexplicable failure right at the end, and that after a breakneck-paced opening in which we establish that evil is ascendant in the wizarding world, nobody is safe, and our heroes don’t have much in the way of a solid plan for how to do anything about it, the film settles into an excellent character study of Harry, Hermione, and Ron on the cusp of adulthood, finally set free from Hogwart’s apron springs, with the weight of the world on their shoulders. In a very real way, every scene of every previous movie has been leading to the last two thirds of this one, where we get to see what has been forged. And I have to say that the same segments of the book didn’t really give me that sense of completion to the series; which is not to say that the movie is better than the book, but that it’s nice to be able to contrast them and find strengths in each. So, okay, I had a little to add to the topic after all, and that’s cool, because those three actors and the various directors who have led them through this past decade of films deserve a lot of credit. But still, on the whole you really already knew what you wanted to do about the latest Potter extravaganza long before I popped open my laptop to give you my opinion, and since you deserve my opinion on something, it’s this: I came out of the movie extremely disappointed. Disappointed, that is, that at least the sixth and probably the fifth movie deserved a similar amount of extra time to flesh out those stories as well, with these actors. Too late to do anything about it now, I guess, but it’s at least nice to see they would almost certainly have been excellent. This entry was posted in Film and tagged fantasy on November 27, 2010 by Chris. As with previous ongoing Star Wars series, Abyss marks a point in the storyline where it gets a lot harder to say anything much useful while also avoiding large spoilers for previous books. But I’m interested enough in seeing where they’re going with it to lay out at least a bare-bones sketch, all the same. First, things I’ve probably already told you anyway: the Fate of the Jedi series takes place some forty years after Luke and Leia and Han saved the galaxy from the Emperor. They have since saved it from the rest of the Empire that wasn’t really done yet despite their boss’s demise, from extra-galactic invaders, and most recently from a newly risen Sith Lord with uncomfortable family ties. Now, the Jedi are trying to save it from themselves, since many of them are suffering psychotic delusions, while navigating a political minefield that has already resulted in Luke Skywalker stepping down as Grand Master of the Jedi Order to go on a pilgrimage and figure out why good people do bad things, more or less. Okay? So, the series at large has been Luke and his son hopping from one group of non-Jedi Force-sensitives to the next to gather this information, while everyone else plays at political shenanigans back home. The political shenanigans have been interesting, but in this book (as, I suspect, ultimately will be the case in the series as a whole) they’ve been largely irrelevant stage-dressing, since they don’t really touch on the Force, which is what we’re honestly here about, right? That part is where I’m getting to be interested, for two reasons. The first is one I’m likely to be let down by in the long run, but they seem to be making a close examination of Lucas' underlying cosmology for the entirety of his creation, and I hope to see interesting conclusions drawn. The second, though, is a thing I haven’t mentioned previously (I don’t think), that there seems to be an old-fashioned Jedi-Sith confrontation on the way. Not the master-and-apprentice always-two Sith Lords of the last good long while, no, I mean the actual Force-sensitive species of them that wanted to take over the galaxy way back before there was an Old Republic. Which admittedly doesn’t sound that different on the surface, but old things coming back has always seemed pretty cool to me, and I do not expect to be disappointed as far as seeing where that goes. So, y’know, possible cool stuff in the outing, and interesting philosophical turns and the omnipresent swashbuckling and aforementioned political shenanigans in the mean time are more than tasty enough mind-candy to keep me coming back for more. I mean, obviously he has never given it even a tiny fraction of this much thought, but I guess at some degree of abstraction he still has veto power. This entry was posted in Words and tagged fantasy, Fate of the Jedi, Star Wars on November 26, 2010 by Chris. I think the main oddity of having started the Jack of Fables series is that it breaks up the flow of the “big event / build-up to next big event” in the main Fables sequence. Thankfully, it didn’t make me like Sons of Empire any less, but it does explain my unwarranted confusion over the slow pacing. Having gotten past that, the story was superlative for one of the down-cycle stories. 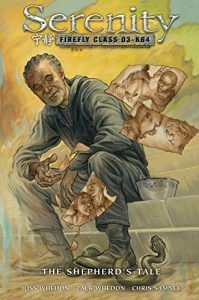 In and around the Empire’s plans of vengeance against Fabletown, family vacations, and thumbnail character sketches of the bit players, the book is mostly about paternal relationships, and mostly about bad ones at that. Still, the woes of fathers and sons would only be so interesting of a theme, however well presented, if it were not for the fact that I’m sure these particular relationships — between Gepetto and Pinocchio, and between the North Wind and Bigby Wolf — will be of vital importance to the rest of the story. Well, or to the next phase of the story, depending on whether or not Fables is an open-ended or an arced tale. I honestly have no idea which is the case, so. This entry was posted in Words and tagged fantasy on November 21, 2010 by Chris. When I saw the imaginatively-named sequel to last year’s Paranormal Activity, I achieved at least a little of what I then claimed would have made it better to watch: to whit, there was far less of an audience distracting me with their overblown terror, making it much easier to focus on the tension growing into dread that both movies most likely contained, though for obvious and difficult-to-validate reasons, I think this latter had a lot more of. The plot is similar to that of the previous movie, which is to say there are people in a house, cameras running all the time (this time from a security system), and gradually more terrifying events occur over a period of weeks, all caught on these cameras and presented to the audience only through those lenses. There are a few more answers than last time, which works out well when you consider that it’s more or less a prequel to the first movie and even includes some of the same characters. But I have to hope you didn’t come for answers, because the point of an old-fashioned haunting story like this is to get nervous, occasionally jump, and spend a little time thinking about the not-always-comprehensible world around you, where answers can be hard to get to on the best of days, and let’s be frank, these cameras are not recording the best of days. Someday, when HTML 5 (or 6) can see where peoples’ eyes are on a screen, I’ll code one of those jump-out jpegs to pop onto the screen just as you finish the review. That’ll be pretty awesome, yo. This entry was posted in Film and tagged horror on November 18, 2010 by Chris. A third graphic novel in the Serenity universe has just recently been released, and I love me my Firefly more than enough to snap it up and into the rotation right quickly. If you are familiar with the universe, the title alone will be all the spoiling you could hope for, and if you are not, this would be a hard (but not insurmountable) place to start. Still, just in case, The Shepherd’s Tale chronicles the history of Shepherd Derrial Book, focusing especially on his life before taking up a berth as a passenger (and eventually as crew) of the Firefly-class transport ship Serenity, a history that up until now has been as shrouded in mystery as anything that happened in that story. There were, to me, a couple of pieces that don’t quite add up, but not enough to object to what was a very well-presented, long term character arc in the fewest number of pages possible. Then again, the nitpicking (and the small sense of letdown from which it stems) could be more about another in an almost certainly finite number of doors closing on one of my favorite stories. As has been my perhaps unfortunate wont, I read the first two as they were released in comic form. So, uh, oops, no review for you. This entry was posted in Words and tagged graphic novel, science fiction on November 16, 2010 by Chris. New Stephen King books really are quite reliable. Once per November, and once per spring, which may or may not reliably be March-or-April, as somehow I’m less used to those and they always catch me by surprise. But not the November ones, and thusly I have consumed Full Dark, No Stars, which is a set of novellas. Unusually, the stories have a unifying theme. Well, three out of the four do, and the odd man out differs in shortness as well as lack of cohesiveness with its brethren and sistren. And that story was only okay, though I will say in its defense that any time King trots out an iteration of his dark-souled Monty Hall stand-in, I’ll at least enjoy those scenes. Anyway, though, the other three stories, concerning a pre-Dust-Bowl farmer, a mystery series author, and a coin collector’s wife, each of them is dark indeed, if perhaps not always as dark as the title would indicate, and they have a lot of common threads. Not, thankfully, the prop of possibly demonic rats that I spent a little time expecting. But misogyny, the penance of confession, and bloody vengeance? Those in spades. I also want to claim justice, but that one is murkier. (Revenge is the crossover point to our odd story as well, if you were hoping there’d be something there.) As is ever the case with King, there’s not a lot to spoil, because he but rarely writes stories with twists, and quite frequently he reveals the destination in the first few paragraphs. But he’s still my hands-down favorite for documenting the winding paths that normal people, who he manages to flesh out into reality with often only a few deft strokes of the brush, will take into or back out of the valley of the shadow of death; or, most often, into and back out. It is always of course possible that there are buried themes in each such collection, and these are just closer to the surface and easier to find, or that I’ve gotten better at it in the intervening years. The former is the more likely of the two, unless I was right about it not being usual in the first place. This entry was posted in Words and tagged horror on November 15, 2010 by Chris. I can just about guarantee you that you’ve seen Due Date before. I mean, the point of a new comedy is to provide semi-unique situations in which the funniness may flower, so you haven’t seen precisely the same movie as Due Date before (unless you have, and it was named Due Date, in which case that’s what I’m talking about right now, so you see). But you’ve seen Planes, Trains and Automobiles. Or, if not that, you’ve seen the Odd Couple, and putting it in a car really doesn’t change the fact that these guys are polar opposite who hate each other a little bit, and yet there are Circumstances that force them to Figure It Out, one way or another. And man, even if you haven’t seen those, you’ve seen Sesame Street. So don’t try to pretend this movie has a new premise. It just doesn’t. Not that there’s anything wrong with that. At least, not as long as your movie is extremely funny or has extremely strong actors to carry the conflict on their backs. Because, really, I think the next genuinely new comedy I see will be the first one that anybody has seen in probably centuries and possibly millennia. This one wasn’t, although it was funny. But there’ve been enough amazing comedies in the last couple of years that I’m both sated and jaded, and therefore more than willing to call out the difference between ‘I laughed’ and ‘I laughed until I was hurting’. This one did. I will I think never get tired of watching Robert Downey Jr. do anything, and Zack Galifianakis, for all that he is not the straight man of the pair, manages to pull off an incredible and limitless flow of dignity through every obscene, absurd, and insane situation that the two of them encounters, and believe me, these are many and varied. But we already have established that you knew that part, having seen this movie-or-possibly-skit-on-Sesame-Street before. This entry was posted in Film and tagged comedy on November 12, 2010 by Chris. Be that as it may, the series’ penultimate volume, Morningstar, does about what you’d expect out of a long literary work: it provides the climax. And when your players are the Devil, the archangel Michael, the massed hordes of hell, and let’s not forget God himself, you are looking at the mother of all climaxes. It is fair to say that this book includes literal Armageddon, as the universe winds down and the biggest questions on everyone’s minds (readers and characters alike) are 1) will we all survive this, or it it really over? and 2) what about dear old Lucifer? Will he save us, die in the attempt, ignore us entirely, or snicker up his sleeve as we are burned in the metaphorical flames of the coming apocalypse? As it has been for a while, the most interesting question to me is how all of these literary takes on the struggle between God and the Devil, fate and free will, order and chaos, they are always based in Judaism without Christianity. I’m not sure exactly what about the revelation interests me, but it is heavily on my mind whenever I’m waist-deep in this kind of story. My current theory, which probably changes once per new such book I read, is that the author fears (rightly or wrongly) that books with Jesus in them wouldn’t sell as well, because while we as a mass of Western Civilization consumers have no problem with Lucifer being ascendant over God at some point in the story, there’s something about Jesus that would feel more inviolable than when it is God, non-sensical though that is when the slightest shred of light is played upon it. Like, it’s some kind of collective gut reaction. …or it could just be that Jesus is simply less literary of a figure than the others, who after all have thousands of years more weight and additional stories behind them than he does. I really have no idea. It’s just something I think about, because he’s really the giant elephant conspicuous by his very absence from the room, when a new retelling of this story gets trotted out. Whether that is a long-term or short-term accomplishment is beside the point. This entry was posted in Words and tagged graphic novel on November 12, 2010 by Chris.